Epiphytic or liyhophytic plant with vegetation (root, flower stalk, foliage) quite identical to Phalaenopsis sumatrana. Flower stalk longer than the foliage with rachis very short, flexuous, little flowered. 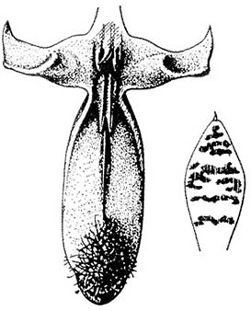 Bracts triangular, cucullates, of 5 mm. 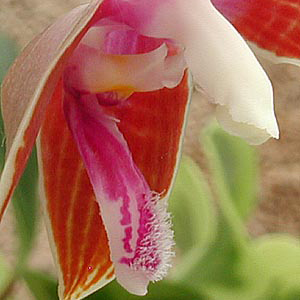 Fleshy flower of 5 cm. Dorsal sepal obovate or oblanceolate, acute or almost obtuse, slightly canaliculate above, carinate dorsaly. Lateral sepals ovate, oblique, slightly canaliculate towards the apex, acute or almost obtuse, prominently carinate dorsally . Petals lanceolate or lanceolate-obovate, acute or obtuse. 3-lobed lip, shorter than the petals. Oblong-ligulate lateral lobes, truncated, with a cushion -like thickening in center. Midlobe almost oblong-elliptic, convex, with a membranous median keel. Apex finished by a callus covered of hairs. At junction of midlobe and lateral lobes, one finds a bifurcate fleshy callus, grooved along midline, basally extending into a pocket-shaped cavity. 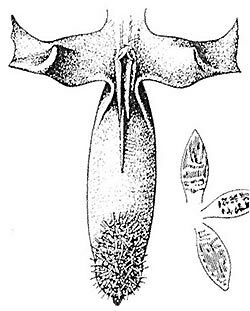 Column fleshy, arcuate, with a well-developped hood-like clinandrium with grossly erose-dentate margins, very similar cap with that of Phalaenopsis sumatrana. Pedicellate ovary of 4 cm. The apical half of sepals and petals cream-coloured , is longitudinally barred of brown dark or of mahogany on a greenish yellow bottom. These bars can be convergent and form continuous spots. The base of sepals and petals is rather decorated of concentric bars also being able to converge. Midlobe and column bases magenta/carmin. Lateral lobes and column white. Thickening on each lateral lobe is yellow orange. One finds it on cliffs limestones at altitudes varying between 450 and 600 meters, and on small trees from 3 to 6 meters. It is considered difficult in culture? The plant needs a strong humidity of the atmosphere, including the night. In nature night condensation covers the leaves abundantly. Scented flowering. It's not alway easy to see difference between flowers of Phalaenopsis corningiana and Phalaenopsis sumatrana. Observation of the midlobe drawing by Sweet could give some indication. Fragrance of the two species is also quite distinct. 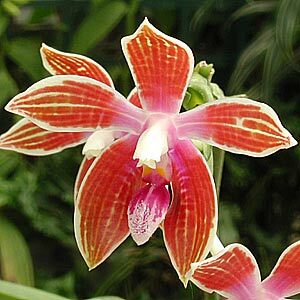 Named in honor to Erasmus Corning, pioneer of the culture of the orchids in the E.U. on the request of Harry J.Veitch for which Corning was an important customer that it wanted to thank.